We all have days where we just can’t really be arsed. Maybe it’s because of the weather (if you’re English…), or perhaps life is just getting a bit too much. Treat yourself to a day of undivided attention, no matter how selfish it feels. You’ll feel better in no time. 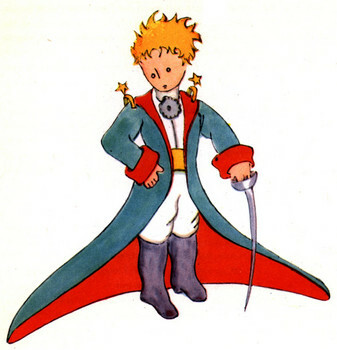 The Little Prince- Antoine de Saint-Exupéry. A lovely book all round. It really does make you realise how trivial most things are, and it also has great illustrations, which is always a plus. The Guernsey Literary and Potato Peel Pie Society. A tale of a community coming together through literature and baking. To Kill a Mockingbird- Harper Lee. A novel that promotes tolerance and love. It may not be happy throughout, but it’s heartwarming nonetheless. Pride and Prejudice- Jane Austen. Or anything by Austen, really. It’ll make you feel all cosy inside. Just thinking about it, I think I’ll schedule a re-read. As will something you read as a child. Try and read The Very Hungry Caterpillar without smiling. The Bucket List. There’s something about Morgan Freeman that makes you feel as if God is personally addressing you. I don’t think you can possibly watch this film without wanting to get off your bum and do something. Shrek. You know it makes sense. (500) Days of Summer. A great love story that may not end the way you hoped, but still has a happy ending. The Change-Up. Just one of those Hangover-esque films to make you laugh. Get outside and find nature. Or just pay attention to what beautiful things are already around you. Put on the radio and dance around. Or do a few stretches. I have a yoga mat in my room to facilitate de-tensing after sitting at my desk too long. Make a cuppa. Then sit down and enjoy it in a comfy chair. Go on. 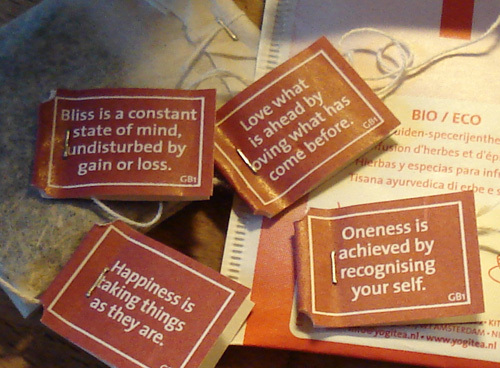 I have “yogi teas” which have lovely little messages on them.